Why is it that the punters here on p&b know cowdens best line up better than Bollan !!!!! Do they? It’s all about opinions. Our strongest team should always include Harvey Swann, I think the vast majority of us can agree on that apart from Gary Bollan. What do you think about Deas? obviously he’s good for us but is he good enough to make it in the premier, and is he good enough for Celtic? we have had Markus Fraser in defence on loan from Celtic previously, and he didn’t last at Celtic but ended up Ross county I think? Is he better than Fraser ? sure Iv heard it’s about 1 in 20 make it at Celtic from their youth team, tough school. I think Deas will end up on loan at a Championship club next season - maybe a Morton. Quality centre back who is Scotland under19 regular and captain and could be playing now in premier league with a bottom 6 team. however, Celtic will buy some Slovakian for 20 million and Deas will end up with some English Championship team. 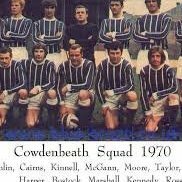 Sad reflection on the development of Scottish talent by our big clubs. Not a chance he will make it at Celtic. I can’t imagine the success rate is close to 1/20 in recent years either. He certainly has the potential to make a career from football though but it is quite hard to tell as he’s playing against people at the arse end of the SPFL. Fraser was playing well for us in a much stronger team against much stronger opposition - hard to compare. He’s Ross County’s captain though and could be back in the top flight next season. That’s a bit of a wild shout. Nothing really to suggest that’s the case. There is little or no development from the bigger clubs. All they do is hoover up the kids with potential and they stagnate and get very few opportunities whilst the club overspends on foreigners, some of whom are at the end of their career. Young players would be far better avoiding the bigger clubs and get game time elsewhere. Instead, they are too quick to sign up and then disappear for a while before eventually playing lower league football in England. Yeah mate it seems to be the case, especially Celtic. They can’t play them all, so many don’t develop sitting on the bench. And they can’t play for a local team /school as they’re not allowed to if signed with Celtic etc. Obviously finances in Scotland are severely weighed in Celtic's favour, thanks to the champions league, so they can take as many youths as they want and it barely makes a difference. I read in todays press and journal that our postponed away trip to Peterhead is to be played on Tuesday 26th February.ive seen no notification on the spfl site but that's pretty pish nowadays.anyone able to confirm? Its also in the fife times online. We play them on the 5th of March at home as well. However , that’s a very rare story. For every Andy Robertson there’s a ton of good players wasted. Some don’t even kick a ball anymore. I know this from first hand experience. My brother in law was Celtic under 20 and did not enjoy it and hasn’t played for anyone else since. He’s not the only 1. Anyway, at least Deas is getting games for a senior club. Hope it stands him in good stead for a career somewhere. The SPFL definitely tweeted it and it appears to be on their site.